In its first appearance in the Walk-On’s Independence Bowl, Florida State topped Southern Miss, 42-13, behind a record-setting performance from freshman quarterback James Blackman. The Seminoles (7-6), led by the combination of Blackman – the Offensive Player of the Game – and wide receiver Auden Tate, found a rhythm early, as they connected on the first of three touchdowns on their opening drive of the game. Blackman finished the game 18-26 for 233 yards and four touchdowns with no interceptions. The four touchdown passes for Blackman set an Independence Bowl record, and his four touchdowns responsible for tied a record, held by three other players. Tate’s three touchdown receptions tied an Independence Bowl record, set a year ago by NC State’s Jaylen Samuels. The combination of freshman running back Cam Akers’ 94 yards rushing and one receiving touchdown and junior running back Jacques Patrick’s 61 yards and a touchdown, helped deliver a balanced offensive attack. Senior safety Nate Andrews took home the Defensive Player of the Game Award, with six tackles (five solo) and a pass break-up. The Seminoles held Southern Miss to 260 yards of total offense, getting constant pressure in the backfield with seven tackles for loss. Southern Miss (8-5) started the scoring on its opening drive on a five-yard touchdown scramble from quarterback Kwadra Griggs. Griggs finished 13-25 for 86 yards and a touchdown, with 39 yards rushing. Senior running back Ito Smith carried the ball 16 times for 92 yards, and also caught four passes for 26 yards. Defensively for the Golden Eagles, Tarvarius Moore led all defenders with 14 total tackles (11 solo) with one tackle for loss and a pass broken up. Racheem Boothe finished with nine tackles. Southern Miss fell to 2-1 in all-time Independence Bowl appearances, collecting victories in 1980 vs. McNeese State and 1988 vs. UTEP. Southern Miss is the first representative of Conference USA to play in the Walk-On’s Independence Bowl. 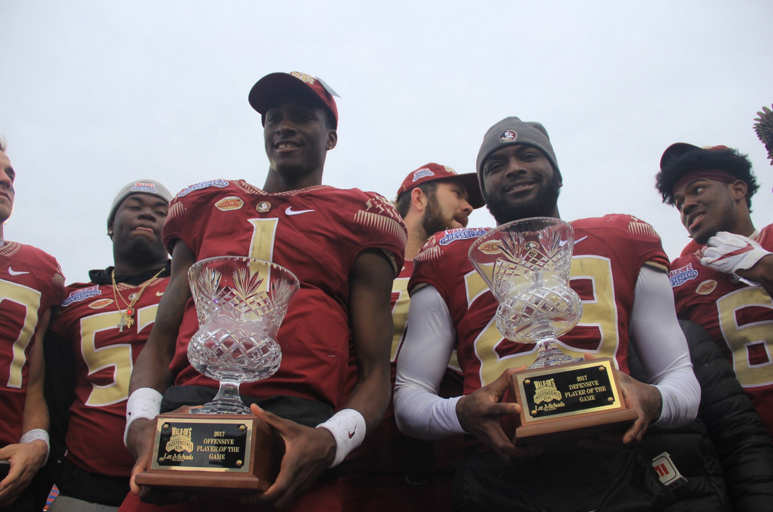 Florida State became the 11th Atlantic Coast Conference representative in the Walk-On’s Independence Bowl, and with the victory, evened the conference’s all-time record at 5-5-1.